The Most APPRECIATING is He Who endows abundantly and lavishly even if deeds are minute, and rewards the simple duties; Allah endues people with high degrees and bestows unlimited bliss for the limited deeds. Allah guides people to take heed and to be grateful to Him; in the Qur’an He praises his thankful worshippers, He says, “..how excellent in Our service ever did he turn to Us!” (SAD, 30), “..for Abraham was, without doubt, forbearing of faults, compassionate and given to look to God” (HUD, 75), “Such in truth are the Believers.” (ANFAL, 4). Appreciation could be by praise and could also be by giving something as a reward; when praise is bestowed from someone of dignity, then hispraise has its great value; the more the reward the greater the giver.Since Allah, Praise and Glory be to Him, rewards the human beinglavishly with much greater rewards than his good deeds, then no one canever imagine a more gracious reward. When He praises His worshippers’ righteousdeeds, then He praises His Own Acts because the human beings’ deeds areHis creation. 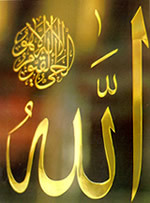 As appreciation comprises praise and reward, then the MostAPPRECIATING is Allah, Praise and Glory be to Him, He is Allah.